4to, vii + 21 pp. Stapled pamphlet, on two different paper stocks (white and grey), front cover detached Text clear and complete. 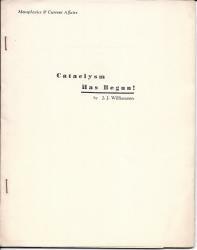 Good, on aged paper, with crease to one corner of title-leaf. Title leaf printed, the rest mimeographed. Pp. v-vii consist of an appendix at the rear of the volume. Occult pseudo-science (the Society's logo is a pentacle), presaging the hippie 'retreat from reason' in the face of Cold War realities. Begins 'For ten years the Society of Metaphysicians has worked in the interests of human unity at all levels. Our statements are supported by this work and by the results of this work, by observation, calculation and fundamental law. 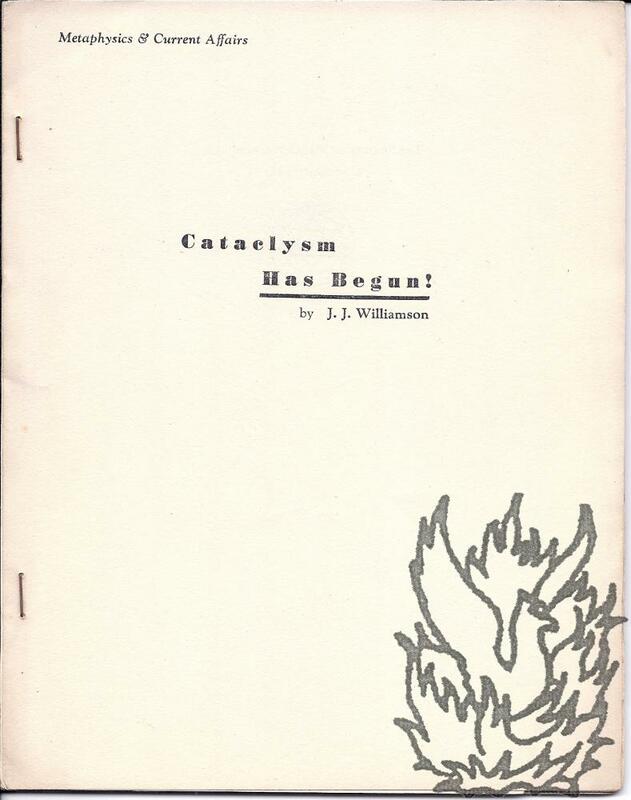 | Now, as a Society, we are able to say emphatically that cataclysm has already begun, is with us now, is gathering its powers of destruction against mankind.' There will be an atomic conflagration, and there is 'no hope for humanity in general', and 'whether we shall, in fact, be able to rebuild as rapidly as [H. G. Wells] suggested, depends upon the magnitude of spiritual values to be found amongst us now'. The public are 'of an average mental age of 7-10 years'. 'Fortunately, many died from privation and disease [in the Second World War].' 'Organised Cooperation' ('group living, group experience and unified essential Brotherhood') is a 'spiritual duty'. The pamphlet is underpinned by a section of 'Supporting Evidence'. Scarce: the only copies of this first edition on COPAC at the legal deposit libraries. The Typed Letter Signed (4to, 1 p), in blue and red ink, urges Brook 'to publicise these important matters'.